Image Size: 28 X 17 in. From her lofty vantage point the young woman gazes over a rocky coastline and out to the distant hazy horizon. A path invites her forward. She begins the journey to the sunlit beach below with one tentative step. 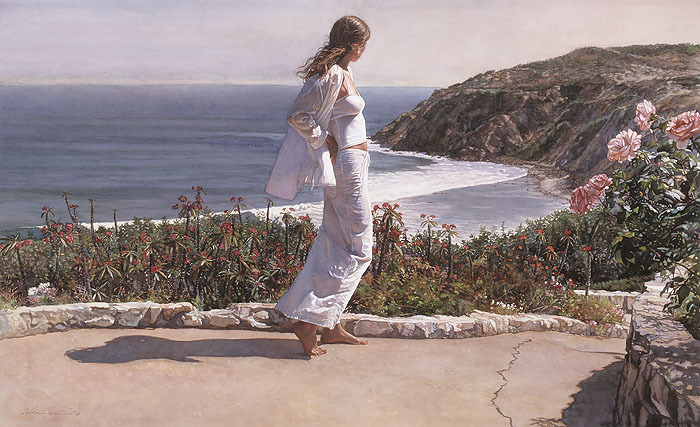 This beautiful image is Steve Hanks at his thoughtful best, suggesting a whole world of possibilities. What is she feeling on this warm summer day. What mysteries, what unknown opportunities lie just beyond the path. The artist poses these questions, then leaves the elusive answers to the viewer.